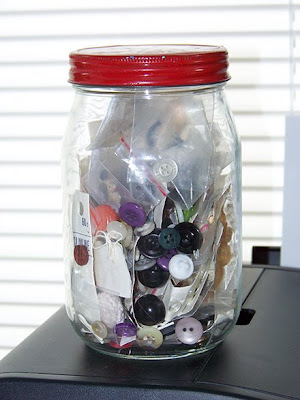 When you get a new garment that has extra buttons, put them in a button jar and save them. Throwing away a garment that's not good enough to pass on to Good Will or some other worthy organization? Take the buttons off and add them to your jar. When you loose a button you may well have a replacement in your jar, saving you a trip to the store and the cost of new buttons. You can also use them in hybrid paper projects (even as drawer pulls), scrapbooking and you can photograph and extract them for digital scrapbooking. Save them long enough and you have antiques! The total cost was $0 and it takes no time at all! And how is this inspirational? We are to be good stewards of all God gives us! This is not only saving money, but recycling! Praise the Lord in ALL THINGS! If you'd like more of these, let me know and have a super day! Today I'm giving you my Button Jar. I actually needed one for an ancestry page in the past - hope you can use it too! It's part of Buttons, Threads & Paper Dolls $1.99 at my PayPal store. Click the Buy It Now button below the preview. I also have a button jar with buttons from my grandmother & my husband's grandmother. Thanks so much! This is too cute! So nostalgic! Thank you!